Have you been hearing about all this custom ROM business – Cyanogen, DamageControl, etc and wondering what in the world all those are about? Or perhaps you already know what those are but are still afraid of trying custom ROMs on your phone because you don’t know how to install them or don’t want to lose your data and current OS state? What do you have to lose now? Try out a new ROM and go back to your original OS in a matter of 30 minutes. Sounds like a good deal? Then let’s go. Note: By the way, having written this tutorial, I know it may seem like there is a lot to do here, scaring you away, but in reality there really isn’t – I was simply trying to provide as much detail and be as clear as possible, covering all the bases. I am using an Sprint HTC Hero (CDMA) in this tutorial and in fact this is exactly how I got Android 2.1 on it using the DamageControl ROM, weeks before it was released by Sprint (in fact, it’s not even released yet at the time of this writing).The specific phone used is not important and I listed it just for reference – ROM Manager should work with pretty much every Android phone. At first I started an explanation of custom ROMs here, but it quickly outgrew itself and demanded to be in a separate post. Who am I to argue with the creative genius? Proceed to read the Custom ROMs For Android Explained And Why You Want Them article and then come back here – I’ll be waiting. By the way, if you are wondering, you will most likely have to wipe when upgrading to a custom ROM (of course, we’ll do a full backup first) but once you’ve installed it, any regular updates are usually applied right over the current version and don’t require any wipes.Remember, all your Google contacts sit in the cloud and will be sync’ed right back as soon as you boot the new ROM and log into Google. Here are the steps, at a glance. Look the list over and move on to the more detailed explanation of each bullet point. The first thing you need to do is root your phone. Don’t be afraid – we already covered this in the Rooting Explained + Top 5 Benefits Of Rooting Your Phone article a few weeks ago, so go ahead and read that first – I’ll wait. Rooting is usually a 5 minute process, and many guides around the web explain what that process is for your exact phone model and Android version combinations, just Google “YOUR_PHONE_MODEL root”. Now that you have root, let’s proceed to the next step. This is the easiest step. Go to the Android Market on your phone and install ROM Manager. This excellent application handles backing up and restoring, as well as flashing new ROMs, all from an easy user interface. This application requires root, which is why we’ve first gone with step 1. This part is very easy and in fact I dedicated a whole tutorial just to this subject which you can read if you want more details about the backing up and restoring process. 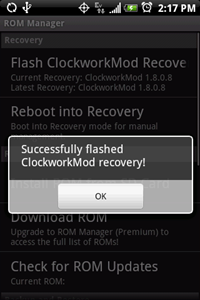 If you read the backup/restore article above, you may have seen that there is a one-time step that was needed before ROM Manager, or any other manager, can install ROMs, back up, restore, or do anything with Nandroid Backup – and that is flashing a recovery image. 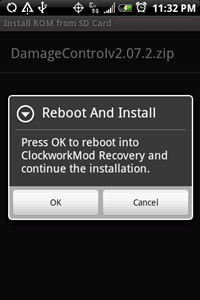 This recovery image contains a boot loader which replaces your original boot loader. The boot loader gives you the ability to run Nandroid backup and restore commands outside of the OS. It also lets you install ROMs but we will not do that today. Since the OS cannot back itself up fully while running, ROM Manager will reboot into this boot loader to perform Nandroid operations. Again, remember: this step needs to be done one time only. Here is where you need to do a bit of research and find the ROM image you want to put on your phone. If you don’t know exactly what you’re looking for, again, Google can help you – just search for “YOUR_PHONE_MODEL ROM” and look around. For instance, if you have a Nexus One, you may want to go with CyanogenMod and if you have a Sprint HTC Hero (CDMA), you will want to check out DamageControl. If you bought ROM Manager Premium, which I recommend, you would have a “Download ROM” menu enabled right within the app, containing some of the most popular ROMs, so you don’t have to look for them online or spend time downloading them on your computer and copying to the phone.If you choose not to use ROM Manager Premium or if the ROM you want is not included in the default list, then keep reading this section. Each ROM you find will be based on a specific Android version – make sure to pay attention to that. In my case, I knew that there were not many options for my Sprint HTC Hero and I quickly found that the DamageControl ROM was exactly what I’d been looking for. It is currently based off Android 2.1 and it’s exactly what I had flashed on my phone to come up with this [p]review: Detailed Mega Review Of Android 2.1 On Our HTC Hero – Discover All The New Features (With Lots Of Screenshots). 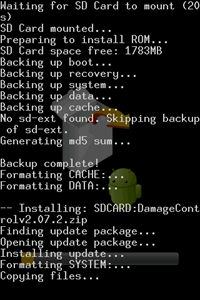 Download the ROM image, which is usually a zip archive, and copy it into the root folder of your SD card. Important: you do not unzip the .zip file – just copy it as is. Once you’ve copied the ROM image, you can proceed to flashing it in step 5. If you purchased ROM Manager Premium for $3.99, in addition to thanking the developer for the awesome job, you’ve also unlocked a few premium features.In particular, the Premium version can download ROMs compatible with your phone straight from ROM Manager. Just select “Download ROM” and see which ones are available for your model. 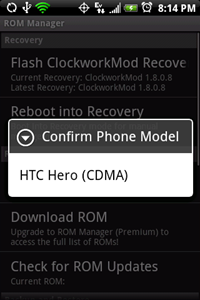 Unfortunately, there is no ROM entered into the app for Sprint HTC Hero at the moment, so you still have to download it manually using the directions in step 4. The process of installing new firmware or low-level system software in general is called flashing. We will be flashing the new custom ROM over the stock one that came with your phone. The ROM you downloaded in step 4 should show up in the list. If it doesn’t, make sure you’ve put it into the root folder of the SD card. wipe data and cache, which you should only do if you want to do a clean install, i.e. when upgrading from the stock ROM. Note: this does not wipe your SD card data – it only wipes the phone’s internal memory. Follow the rest of the prompts and voila – the ROM is being installed! The flashing process should take 5-10 minutes installing everything and then 10-20 minutes during the first boot. Please be patient during this process. Once the phone boots, you should find yourself in the new ROM. This is it – end of the road! You’ve done it! Enjoy your fast and clean phone. If after the “Reboot and Install” step, you immediately get a picture of Android with a big exclamation point, most likely it means the ROM image you downloaded was not cryptographically signed by the developer (which happens if they were in a hurry to release or simply don’t use encryption). Alright, you may want to restore the original full backup of your OS that you took in step 3 (or 5). Maybe you forgot something in the original installation or want to go back to stock for another reason – no problem. 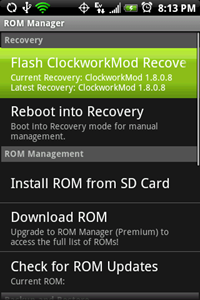 Install and load up the ROM Manager app in the custom ROM you flashed (basically, repeating step 2). Now use the “Manage and Restore Backups” menu to find your backup and restore it (including the OS itself and all the apps, settings – everything that you backed up). You can read more about the Backup/Restore procedure in our tutorial called [Complete Guide] How To Fully Back Up And Restore Your Android Phone Using Nandroid Backup. Previous post Android 2.2 (Froyo) spotted on the Nexus One!